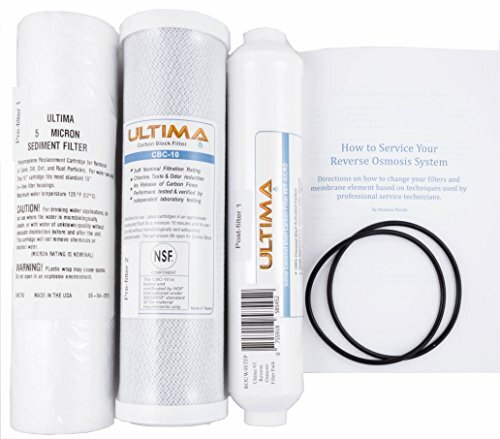 4 stage reverse osmosis replacement filter pack for Ultima Model V or Model VI. Includes 1 - 5 micron sediment pre-filter and 1 - carbon pre-filter, 2 - canister O-rings and 1 - inline post-filter. will also fit International Filter RO4, GE model GXR10, Watts 4 stage and ZRO4, Cost Less, Pure Flow, and most other 4 stage reverse osmosis systems. Includes the service manual "How to Service Your Reverse Osmosis System" by Dionicio Porras. Service your RO like a pro! Includes the service manual "How to Service Your Reverse Osmosis System" by Dionicio Porras. ROFCTK, Filter change tool kit available separately. Service your RO like a pro. If you have any questions about this product by Ultima by Desert Water Conditioning, contact us by completing and submitting the form below. If you are looking for a specif part number, please include it with your message.